We've been hearing a drumbeat recently of claims that a universal basic income—in effect, a monthly welfare check sent to everyone—is going to be necessary to save all the poor unfortunate souls put out of work by self-driving cars, artificial intelligence, robots, and other new forms of automation. We are told that the basic income will be "the only way to keep the country's economy afloat" in an age of automation, or that it will be necessary to absorb millions of truckers thrown out of middle-class jobs by the advent of autonomous vehicles. Of course, this being the field of high technology, there are always those who will say that it's not a bug but a feature. So we get Peter Diamandis reassuring us that "technological socialism" can "demonetize living." I have already thrown some skepticism at the idea that there is going to be a traumatic transition that will throw middle class people out on the streets without warning—rather than a long and gradual transition over decades, to which people can adapt. The future doesn't come that fast, and we will get a chance to see it coming. The best response is to encourage people to respond to technological progress and to seek out the new jobs that will become available as the old ones fade away. Yes, automation is going to disrupt the economy, just as technological progress has always disrupted the economy, continually, since the beginning of the Industrial Revolution. But helping people to adjust by putting them on a permanent welfare subsidy is the worst and cruelest response, precisely because it pays them not to adapt to the new economy. Let's take a step back and look at the history here. There is nothing really new about the technological claims in favor of a basic income. The fear that new technology would put people out of work permanently, as well as the promise that it would make it possible for us to live in a utopia of uninterrupted plenty without the necessity of toil—these claims are as old as the Industrial Revolution itself. They have been made for every previous advance in technology, long before autonomous vehicles and artificial intelligence. The two sides of this approach are exemplified by the Luddites and Owenites. The Luddites, of course, believed that the first steam-driven power looms were going to put weavers out of work. At about the same time, the Owenites took a more optimistic view. Inspired by the industrialist and social reformer Robert Owen, they thought that the new production methods of the Industrial Revolution would make it possible to create a socialist utopia in which everyone could be provided equally with all the needs of life. Both were wrong. The Luddites were gripped by fear of the unemployment and impoverishment of the masses, at the beginning of the greatest advance of human prosperity in history. The Owenites, bankrolled by Owen's capitalist earnings, tested out his socialist theories by founding a utopian community in New Harmony, Indiana. It folded within four years. But this is an idea that dies hard. It was, arguably, the whole impetus behind Marxism: the idea that the new machine technology of the Industrial Revolution would automatically produce such a hyper-abundance of wealth that it would be possible to build a society on the principle of "from each according to his ability, to each according to his need," in which income was separated from work. The economy of abundance can sustain all citizens in comfort and economic security whether or not they engage in what is commonly reckoned as work. Wealth produced by machines rather than by men is still wealth. We urge, therefore, that society, through its appropriate legal and governmental institutions, undertake an unqualified commitment to provide every individual and every family with an adequate income as a matter of right. When were we on the cusp of this new utopia of "nearly unlimited" wealth that would eliminate the necessity for human work? That particular manifesto was sent to President Lyndon Johnson in March of 1964, shortly before he announced his ideas for the "Great Society." Keep that in mind because it's going to be important later. Now we see the same old chestnut dragged up again with robotics and artificial intelligence, because this latest round of technological progress is absolutely, totally new, and This Time Is Different. But if this time is not different, what lessons can we learn from the previous go-arounds? Well, one of the lessons is that no matter how sophisticated the system, no matter how advanced our machines seem to be, relative to what we're used to, somebody still needs to do the work of keeping them running. We need someone to monitor them, maintain them, and regulate them, someone who understands how they work and how they connect to other systems. There are millions of people employed in the technology sector right now, people whose job is to keep our computer systems going, patch them together, make them talk to one another, fix their flaws, and continually upgrade them. Ask them how "automatic" that work is, or is likely to be any time soon. And that's not to mention the productive role of innovators who discover new uses for our machines or who design and build new ones. Yet this entire industry is new and was entirely unimagined by the people who, back in 1964, thought their imaginary "cybernated" system was just going to run itself. The downside of this, if you want to view it that way, is that work is still necessary. The upside is that work is still necessary and is far more productive and therefore higher-paying. The average annual income for tech industry workers is about $100,000. Yes, the transition can be harsh for some workers. But let's be more specific: it is harsh for those who are unable or unwilling to adapt and develop the new skills required for the new work. And that's precisely why the basic income is such a disastrous idea, because it is a massive disincentive for precisely that kind of adaptation. The basic income does not just remove the incentive to work. It actively punishes work, in the form of steep tax. I have written elsewhere about the central economic flaw of this system, what is called the Basic Income Impossible Trinity. The upshot is that the more generous you make the basic income, the more you make it a replacement for even a lower middle class income, the more unaffordable it becomes, and the more steeply you have to phase it out for those who choose to work. If the basic income will pay you $30,000 a year to do nothing, and that subsidy goes away as you make more money, so at an income of $100,000 your government subsidy disappears, you are paying an implicit tax rate of 30% on top of the taxes you are already paying to support everyone else's basic income. So why chase your tail working hard to advance to a higher income that is mostly going to be canceled out, when you can stay home and live a fairly decent life without doing anything at all? Fearing the loss of jobs shouldn't be a fear at all. It should be welcomed. It should be freeing. Ah, the age-old dream—to live without working! Which always ends up meaning to live at the expense of somebody else who does work. The practical risk of such a system is that you will lose the industrious worker bees you are depending on to keep the "automated" system going. But let's stipulate that some people will continue to be ambitious and acquire advanced skills and work hard to get ahead. Here is where the basic income is actually cruel and callous to those whom it lures with the prospect of life without work. Because life without work also means a life of economic stagnation, and in practice the basic income works to widen the gap between the technological haves and the have-nots. Like I said, no matter how sophisticated the system, no matter how much the machines can do, someone will always be needed to regulate them, to keep them running, to improve them. The more automated the system is, the more it can produce from one person's work, the greater the rewards for being one of the people who knows how to make it function. The job of tending to the machines becomes more and more sophisticated and intellectually demanding—think auto mechanic versus Google engineer—but it also becomes much more productive and financially rewarding. Thus, the basic income functions to divide workers into two tiers: those who decide to opt out of the new economy, collect a check, and leave the workforce—who never adapt and miss out on all the rewards of the new economy—versus those who work, advance, and become the technological upper class. To understand this, it's helpful to look at the previous round of economic disruption. Before there was "de-industrialization," there was de-agriculturalization. 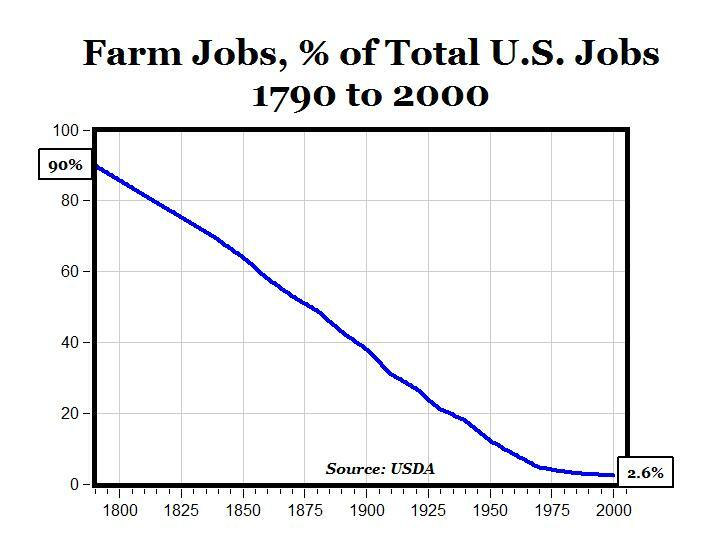 Over the long term, the percentage of the population employed in agriculture has steadily declined, even as our production of food has steadily increased. This, by the way, is precisely the pattern we're seeing today for manufacturing: the combination of increasing output and decreasing employment. Previous generations—including my grandparents and great-grandparents and probably yours, too—adapted to this by moving off of the farm and taking the new factory jobs or professional jobs, which ushered them into the great mid-20th-century prosperity of the industrialized economy. In other words, the middle-class industrial prosperity we're so worried about losing in the current round of technological disruption was itself the product of a previous round of technological disruption. Now let's imagine what would have happened if we had decided to respond to the disruptive force of de-agriculturalization by putting all of the displaced farm workers onto a basic income to provide for their needs, then patting them on the back and telling them to embrace this exciting new opportunity to be free from work. We would have created an incentive for these workers not to leave their rural communities for the big cities and not to take on the new factory jobs. These were, after all, difficult and even traumatic disruptions of their way of life. And so they would not have joined the modern economy. And the level of that basic income, if it were meant to provide something nearly equivalent of the earnings of a 19th-century farm laborer? Perhaps $10 a week, equivalent today to about $270 a week—which is to say, below the poverty line. And even then, the purchasing power of that money is dependent on a century of industrial production that might not have happened if most people stayed home on the farm and did nothing. But we don't really need to do a fancy thought experiment about this. For all the talk about instituting small-scale trials of the basic income, we've already instituted a large-scale trial of the basic idea. It was called the War on Poverty. Remember that letter to Lyndon Johnson, urging him to adopt a guaranteed income? A few months later, in May of 1964, he laid out his plan for the Great Society and embraced all of those basic ideas—everything we are still hearing from the proponents of the basic income. There's the idea that we won't have to worry about how to produce goods because that problem has already been solved, combined with fuzzy-headed utopianism about the more spiritually enriching life we can lead when we, in LBJ's words, are liberated from "unbridled growth" and an obsession with "soulless wealth." For a century we labored to settle and to subdue a continent. For half a century we called upon unbounded invention and untiring industry to create an order of plenty for all of our people. The challenge of the next half-century is whether we have the wisdom to use that wealth to enrich and elevate our national life. Within your lifetime powerful forces, already loosed, will take us toward a way of life beyond the realm of our experience, almost beyond the bounds of our imagination. I once described this as making LBJ sound like "a big, doe-eyed, muddled-headed hippie." But maybe he was just an early "futurist." The problem is that we know the results of his experiment with these ideas. The future came, and it didn't work out the way he thought it would. When he launched his War on Poverty, President Johnson proclaimed, "Our American answer to poverty is not to make the poor more secure in their poverty but to reach down and to help them lift themselves out of the ruts of poverty and move with the large majority along the high road of hope and prosperity." But "making the poor more secure in their poverty" is exactly the result he achieved. Officially, the poverty rate has only declined from 19% to about 16%—but by the admission of the War on Poverty's own defenders, "If government benefits are excluded, today's poverty rate would be 29 percent." That's what it means to make the poor more secure in their poverty. The basic income would make this system official, encouraging displaced workers to accept an intentional state of permanent poverty, on the promise that the government will always have enough money to take care of them. So the basic income, as an economic program, is a plan to lure a large group of people into withdrawing from the economy and living in a state of economic helplessness and stagnation, separate from a technological elite who enjoy wealth and influence. It is not exactly the progressive utopia it pretends to be. And do you know what the really perverse part is? That it is all unnecessary. This is an attempt to lure people into a dead end of idleness precisely in response to new technology which offers them greater opportunities than they have ever had before. Rob Tracinski is the editor of RealClearFuture.